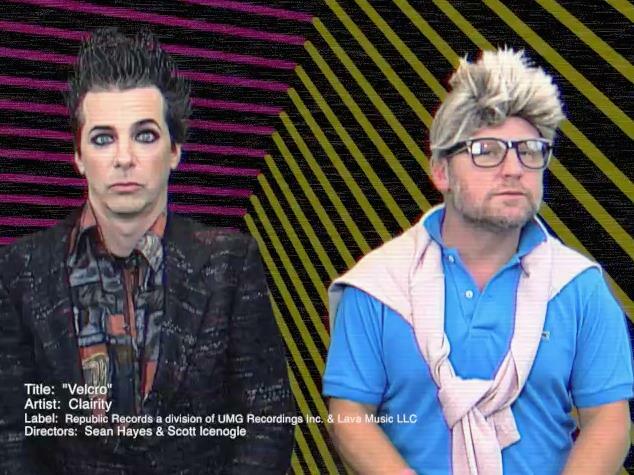 A couple of weeks ago, in honor of TBT (that’s Throwback Thursday, Dad), Sean Hayes and his boyfriend, Scott Icenogle, posted this adorable lip synch video to the newly-released eighties-sounding single by Clairity, “Velcro.” The song is seriously fun and listenable, and Sean and Scott’s video doesn’t disappoint either. Rumor has it this video is part of Sean’s unofficial campaign to get on the popular Spike TV show “Lip Synch Battle.” I’ve been watching the show, but nothing could possibly top the epic Emily Blunt/Anne Hathaway faceoff from April, so I’m kind of losing interest. However, if they bring Sean Hayes on, I’d certainly tune in again. He still looks good in Velcro. Too funny. That song is so stuck in my head . . . Luckily, I like it.